Very convenient place to enjoy shopping, gourmet, movie theatres, department stores, Spa (Sky Spa), etc... Buses from Narita airport and Haneda airport arrive at YCAT (Yokohoama City Air Terminal), and v.v.. Both East and West exit, there are many people. And the access to Yokohama is convenient. 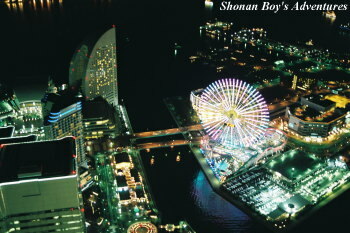 There are the Yokohama Land Mark Tower, Land Mark Plaza, Yokohama Cosmo World (amusement park), Kisha-michi promenade, Pacifico Yokohama (convention centre), Yokohama Museum, hotels, many shipping centres. It takes only 40 seconds through level 69 by pay high speed elevator at Land Mark Tower. It is very nice view! Especially night view!! There are many people who want to relax and see Bay Bridge. And there is the "Pukari Pier", short distance ship called "Seabass" depart. 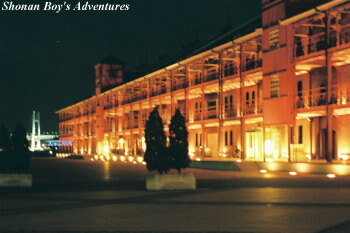 Red Brick Warehouse is located near Minatomirai. Get off at "Minatomirai" station of Minatomirai line. Get off at "Sakuragicho" station of JR Negishi line or Subway Blue line. 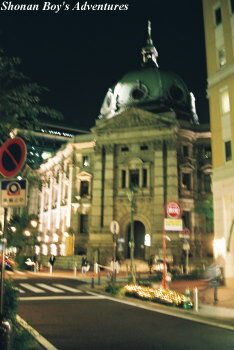 It is located in Minatomirai. It takes only 40 seconds through level 69 by pay high speed elevator at Land Mark Tower. Observation floor is called "Sky Garden", that is 69th floor and 273 meters high. It is very nice view! Especially night view!! The first few floors are a shopping mall, interconnected with neighboring Landmark Plaza. As well, there is Yokohama Royal Park Hotel on upper floor. 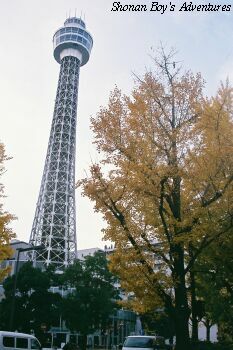 Yokohama Landmark Tower is 296 meters high, and 70 story building, and tallest building in Japan. Please check the business time and holidays before you visit. From "Minatomirai" station of Minatomirai line, 3 minutes walk. From "Sakuragicho" station of JR Negishi line or Subway Blue line, 5 minutes walk. 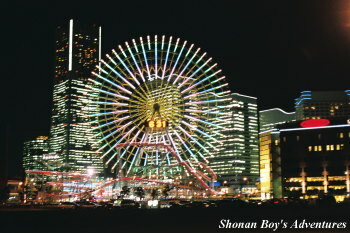 It is located in Minatomirai. There are "Sailing Training Ship NIPPON MARU", and" Yokohama Port Museum" in this park. In "Sailing Training Ship NIPPON MARU", visitors can tour inside the ship and will learn about the living history and sea training of NIPPON MARU. In "Yokohama Port Museum", visitors can learn history from opening harbour through the present. From "Minatomirai" station of Minatomirai line, 5 minutes walk. From "Bashamichi" station of Minatomirai line, 5 minutes walk. NYK means a company of "Nippon Yusen Kaisha". Company history is introduced, and there are ship models, ship movies. Also explanations of passenger ships, freight ship, ship history and future ships are displayed in detail. A set ticket of this museum and the "Hikawa" ship are sold here. Please check the business time and holidays before you visit. From "Bashamichi" station of Minatomirai line, 2 minute walk. From "Kannai" station of JR Negishi line or Subway Blue line, 8 minutes walk. This building of neo baroqueis registered as important cultural assets. There are many collections, Ukiyoe, black ship model, etc... Please check the business time and holidays before you visit. From "Bashamichi" station of Minatomirai line, 1 minute walk. From "Sakuragicho" station of JR Negishi line or Subway Blue line, 8 minutes walk. This building is also called "Jack's Tower". Around it, there are "King's Tower (Kanagawa Prefectural Government)" and "Queen's Tower (Yokohama Customs)". It was opened on 1st July, 1916. The tower is about 36 meter high. There are Hall, conference rooms, and historical materials. Please check the business time and holidays before you visit. From "Nihonodori" station of Minatomirai line, 1 minute walk. From "Kannai" station of JR Negishi line or Subway Blue line, 10 minutes walk. It was built in 1928. It may not be appropriate for sightseeing to enter it. Let's enjoy the outside. Please check the business time and holidays before you visit. From "Nihonodori" station of Minatomirai line, 0 minute walk. From "Kannai" station of JR Negishi line or Subway Blue line, 12 minutes walk. There is an exhibition room on 1st floor of Yokohama Customs. 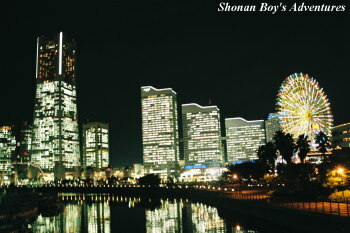 There are explanations of Yokohama Harbour and Yokohama Customs. And forbidden inport items are displayed. Please check the business time and holidays before you visit. From "Nihonodori" station of Minatomirai line, 3 minutes walk. From "Kannai" station of JR Negishi line or Subway Blue line, 15 minutes walk. 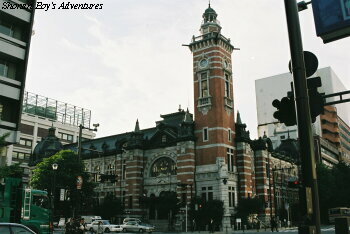 It is very good place to know the history of opening Yokohama Harbour. There is a tree of "Tamakusu", that has been located since the open of Yokohama Harbour. Please check the business time and holidays before you visit. From "Nihonodori" station of Minatomirai line, 2 minutes walk. 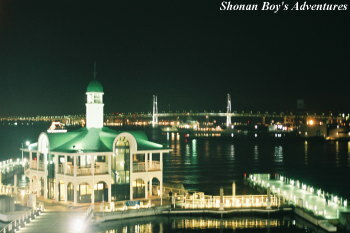 "Yokohama Bay Bridge" and "Yokohama Harbour"
In 1911, Warehouse NO.2 was completed, and was used up to 1989. Since April, 2002, Warehouses NO.1 & 2 have been used as a shopping malls. 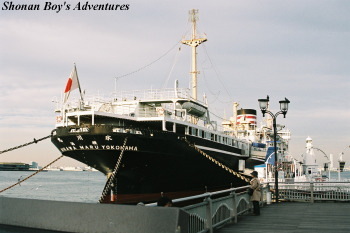 From Pier Akarenga (closed to them), there are several lines of Yokohama excursion ships. Please check the business time and holidays before you visit. From "Nihon-odori" or "Bashamichi" station of Minatomirai line, about 6 minutes walk. From "Minatomirai" station of Minatomirai line, about 12 minutes walk. From "Kannai" station of JR Negishi line or Subway Blue line, about 15 minutes walk (via Kishamichi). It was reconstructed as the 150th anniversary of opening Yokohama Harbour. And it was completed in 2nd June, 2009. There is a coffee house with a nice view of harbour. Let's walk along "Yamashita Rinkosen Promenade" from Redbrick Warehouse => Zono Hana Park => Yamashita Park! Regarding coffee house, please check the business time and holidays before you visit. From "Nihon-odori" station of Minatomirai line, 3 minutes walk. Notice: Sailing Boats are only for exhibition. It is called "Osanbashi". Luxurious liners depart, and call here. 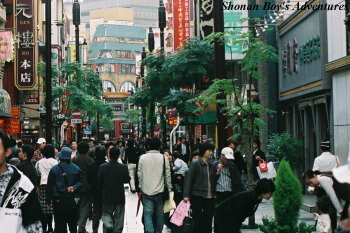 There are restaurants and souvenior shops. The view from roof garden is very beautiful. 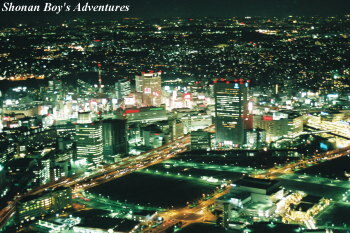 Especially, night view. Please check the business time and holidays before you visit. From "Nihon-odori" station of Minatomirai line, 7 minutes walk. It takes 3 minutes from China Town. Once the international ship "Hikawa-maru (the Hikawa)" had left and arrived here. Now this ship is opened as museum. As well, ships for excursion, lunch cruising, dinner cruising departed from this harbour. Visitors can see Minatomirai, Yokohama Bay Bridge. There are some sightseeing spots, such as Marine Tower, Silk Museum, Yokohama International Passenger Terminal (the pier called "Osambashi"). 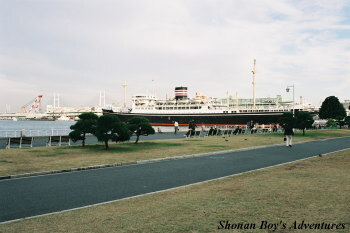 From Yamashita Park Pier, there are several lines of Yokohama excursion ships. Especially I recommend excursion ships that takes 90 minutes and over. 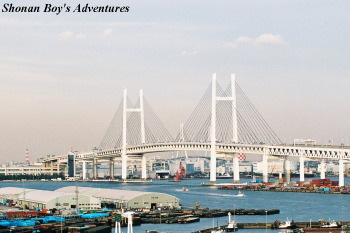 So you can enjoy to see "Yokohama Bay Bridge" and "Tsurumi Tsubasa Bridge". The pier of excursion ships are located next to the "Hikawa". From "Motomachi-Chukagai" station of Minatomirai line, 3 minutes walk. From "Ishikawacho" station of JR Negishi line, 15 minutes walk. There are many kinds of dolls from many countries. 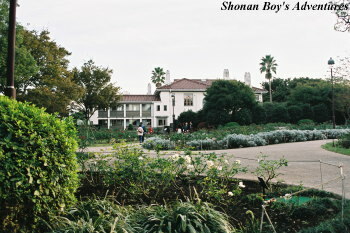 It is located closed to Yamashita Park. Please check the business time and holidays before you visit. From "Motomachi-chukagai" station of Minatomirai line, 2 minute walk. From "Ishikawacho" station of JR Negishi line, 13 minutes walk. Yokohama Marine Tower was planned in 1958, and was completed in 1961 for the 100th anniversary monument of opening Yokohama Harbour. Once it had been closed. 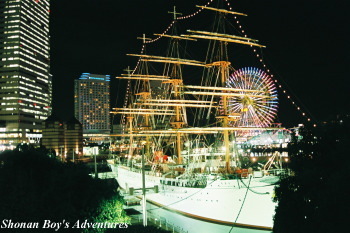 After refurbishing, it was opened in 2009 again, the 150th anniversary of opening Yokohama Harbour. It is 106 meter high, and observatory hall is located on 106 meter high above sea level. There are some restaurants below. It is located closed to Yamashitia Park, and visitors can see Yokohama Harbour that is nice view. Please check the business time and holidays before you visit. From "Motomachi-Chukagai" station of Minatomirai line, 1 minute walk. The town of gourmet that is located near stations. And there are many Chinese restaurants, Chinese refreshments shops, souvenir shops, phamacies of traditional Chinese medicine, etc... Let's try Chinese food here! From "Ishikawacho" station of JR Negishi line, 3 minutes walk. From "Kannai" station of JR Negishi line or Subway Blue line, 5 minutes walk. 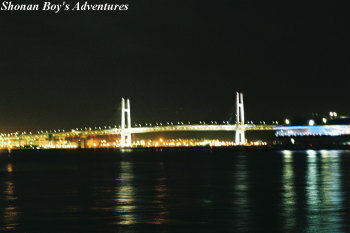 It is located on the hill, and visitors can see the "Yokohama Bay Bridge" and "Yokohama Harbour". Easy access from Yamashita Park on foot. 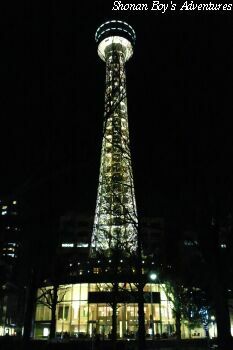 Let's enjoy walking Motomachi shopping mall after seeing this park! From "Motomachi-Chukagai" of Minatomirai line, 8 minutes walk. From "Ishikawacho" of JR Negishi line, 15 minutes walk. From "Sakuragicho" station, take the municipal bus Route 11. Get off at "Minato-no-Mieru Oka Koen" bus stop, and 1 minute walk.